I recently joined the 21st century by finally purchasing a tablet. I previously felt I had no reason to – I use my laptop for typing, and I’m not one to lay in bed with a TV show playing on my chest. Now that I actually have one, I have been sucked in completely after discovering its number one purpose: stupid, social city building games. If there’s a game where you’re building a town, farm, Springfield, or even the Men in Black HQ, then it’s installed. The tablet has unlocked my true calling as a bored Midwestern housewife. You start with nothing, and build your humble town from there. After poking (ha ha!) around with these long enough, I felt the spark of interest to go back to the game almost directly responsible for making town construction a viable genre. 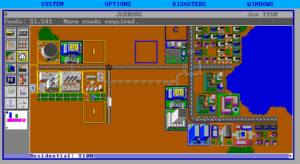 Wil Wright’s famous city builder exemplifies the 80’s PC games I love – a willingness to try crazy new ideas, alongside a dogged determination to replicate real-world mechanics in an enjoyable manner. SimCity does all of these in a comfortable, sandbox approach, giving you nothing more than a tract of land to work with and the goal to build your town to a Megapolis population of 750,000. Everything is built along an invisible grid, and all structures you place are essentially 3×3 tiles. Tiles adjacent to each other share utilities and some occasional bonuses to property value. You’re also rarely placing specific structures. With a handful of exceptions, most of your involvement comes from placing “districts,” in Residential, Commercial, and Industrial flavors. These districts then automatically grow and expand their own buildings based on your city’s overall success. You’ll need some practice learning what the little facility icons mean, but it’s fairly easy to note, at a glance, when houses are turning into upscale apartment blocks, or when people are vacating the area entirely. When we played this in school, I was absolutely one of those who just loaded up a scenario and triggered all the disasters. 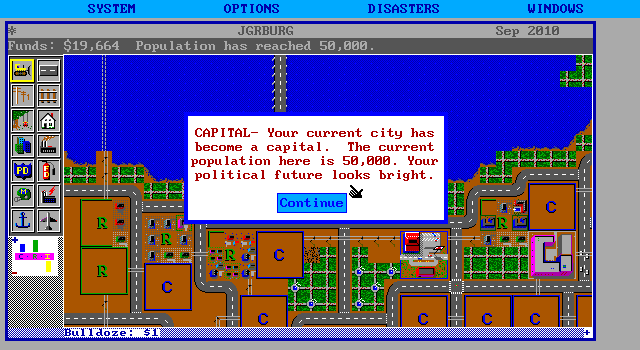 Population is king in SimCity, and every object you place will have a positive or negative effect. Congested roads, heavy industrial areas, and coal power plants all create pollution, which drives the population out of any residential areas placed too nearby. If commercial and industrial areas are too far from the residential zones, people get disgusted with the long commute. If your town is booming and there aren’t enough residential zones, people bail as housing prices get too high. And should you ever raise taxes – your sole source of income, by the way – you’re in for a virtual mutiny. Sims always somehow have the finances and willingness to pack up and leave town over the smallest issues, so making it to Megapolis will in no way be easy. Then there are the randomized disasters that crop up, including fires, floods, earthquakes, and tongue-in-cheek monster attacks. You have no defense against these, and pretty much have to wait them out and pick up the pieces after – the sole exception being a healthy placement of fire departments to prevent fires from spreading wildly to adjacent buildings. Bulldozing and replacing damaged buildings costs money you likely don’t have, but then, so does the upkeep of fire and police departments (to combat crime in a radial model similar to pollution). You can turn the disasters off for an easier game, but will have to live with the shame of being a complete weenie. On the way, but still a long way to go. It’s a surprisingly elaborate model that even considers higher housing prices for waterfront property. Yet the game does its best to keep things accessible. Once you understand the rules of the simulation (helpfully explained in the manual), you’re able to make incremental changes without cocking things up completely. An indicator in the corner tracks the demand for new types of districts, and the ever-useful map includes overlays showing areas of pollution, crime, traffic jams, and more positive things like population density and commerce. You can use these to spot where changes need to be made, and where demand is for your next construction. You can further hold Q and click to “query” any tile and see a window of stats detailing crime, pollution, density, and if its growth is trending up or down. That’s the entirety of the game. There are no tiered goals to meet, no random events, no series of missions that need to be completed. It’s just you, trying to manage your finances and population to make Megapolis. Replayability comes in the form of randomly generated terrain on each city creation. You can’t build on (or fill in) any water spaces, so when you think you’ve mastered the game, try doing it again on a map with half as much available land. Six scenarios also exist, challenging you to repair a premade metropolis with some critical flaw – Tokyo after a monster attack, Boston after a nuclear power plant explodes, Detroit in the throes of a crime wave, etc. You’re given ten years and limited funds to turn the city prosperous again. The maps and their information are absolutely indispensable. 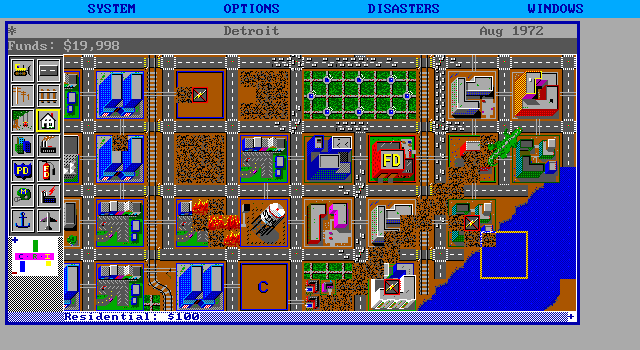 SimCity’s not perfect, of course. The transportation model feels the most unfinished. You can place roads, or more expensive trolley rails. Roads will congest while rails magically will not, and the manual’s suggestion for dealing with traffic is to simply replace the congested section with rails. There are no train stations to be built, and no repercussions for building a counter-intuitive patchwork route of the two types. In fact, you can build an entire city with only rails and no one complains – it’s mass transit at its most utopian. The only drawback is you’ll forever be pestered by a message that you “need more roads,” presumably a leftover of a requirement that didn’t make it into the final game. There are also times that the system just doesn’t seem to work. The district meter is spiking on demand for commercial zones, but a handful of districts you’ve already planted just aren’t taking. You can watch as districts grow and decline in the span of a few months, before you even have a chance to nail down what’s going wrong. The manual talks about an “external market” that’s supposedly buying your industrial goods, but you never see indications of it in the game. If your city is somehow reflecting decreased demand for your products, you’ll never know – and not that there’s anything you could do about it anyway. In practical terms, this all means your city will see periods of famine and fortune, and you should prepare for plenty of “urban renewal” and re-districting along the way. In practice, it’s still annoying to look at a cluster of unused districts and be forced to shrug, bulldoze them, and try them again in an arbitrary new location. Finally, the best version of SimCity was actually made by Nintendo for the SNES. The interface is cleaner, the underlying systems a little more intuitive, and the addition of your green-haired assistant makes some of the more puzzling aspects (like why your damn city isn’t growing like it should!) a little less obtuse. It also includes an array of special buildings (such as an amusement park or a casino) that convey bonuses to surrounding districts and give you some colorful new decorations to place. 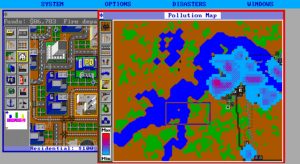 None of these improvements ever made it back into the original game on the PC, so if this game seems too primitive for you, you’ll probably want to skip on to SimCity 2000. Since the game’s already built around an interface of windows, the Windows port benefits significantly. Graphics are mostly just functional. There are no considerations for terrain, so land is a uniform shade of brown, with the same green tile for any foliage. There are no seasons, like those added in the SNES version. Buildings are actually fairly detailed, and their unique appearances as they expand serve the gameplay too. 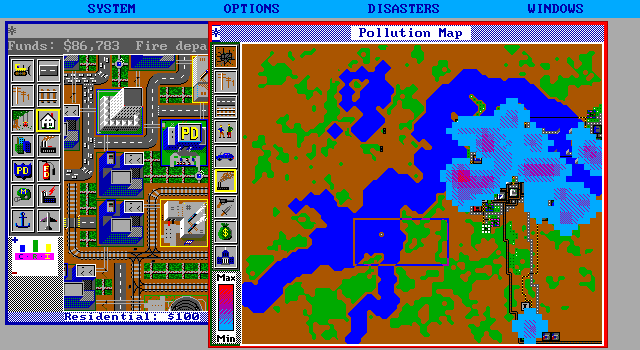 Animations are similarly sparse and appear only to show gameplay indications – stacks of cars on congested roads, fires spreading or lizard monsters sacking the town, and the occasional plane or ship passing through. I would have liked to have seen more gameplay conditions get special artwork, such as visible slums popping up in high crime areas, or perhaps soot in a heavily polluted zone. Occasional, scratchy sound cues (explosions, police radios) round out the presentation. There are also a few versions out to choose from. 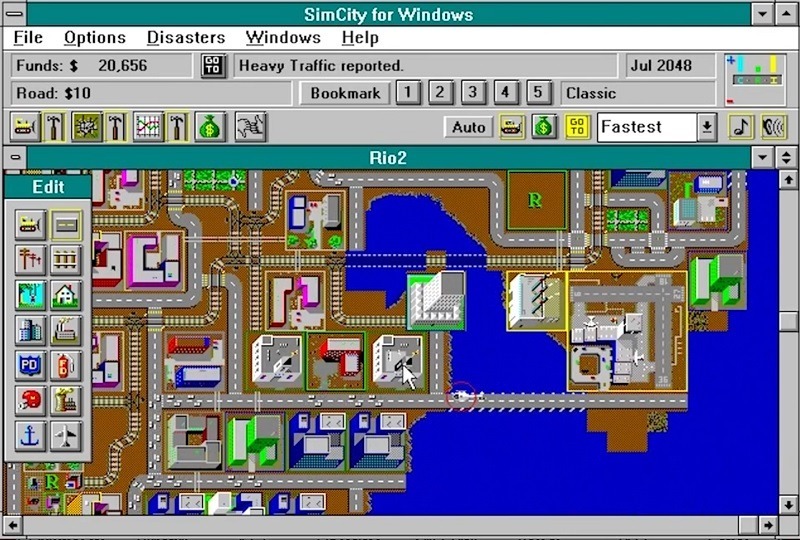 SimCity Classic was released in 1993, and adds support to Windows 3.1. The only change here is to the interface. You can now move and resize the map windows, and a row of very Windows-esque buttons allow you to toggle views and tool panels a little more efficiently than the DOS menus. 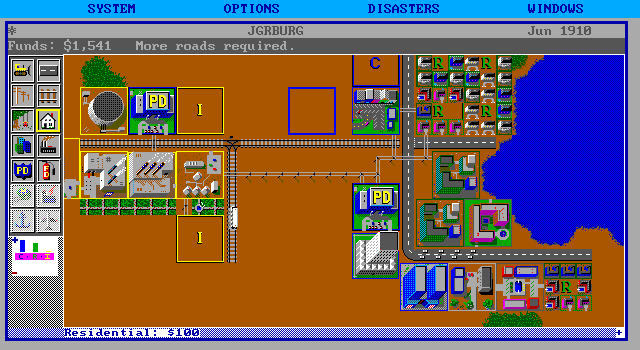 The DOS version also suffers from some choppy performance, especially when drawing those maps and navigating around the world, which improves with Windows. A later, enhanced CD release for Windows redraws the city tiles at a higher resolution, and adds in some cheesy FMV news reports and crisis videos. Pure fluff. 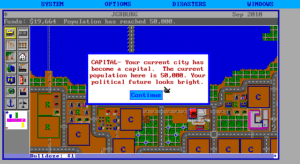 Two graphics packs were also released in 1990, simply changing the text and look of the tiles to fit the themes of Ancient and Future cities. This first title is as far as I’ve ever gotten in the series, so I can’t say if things improve (or the opposite) from here. As a stand-alone title, the first SimCity is an impressive execution of a very smart concept. Yes, there’s room for obvious improvement, the limited interface holds you back, and much like with Theme Park you’re building to maximize the efficiency of a model, not free-building the town as you please. Still, it’s a fun challenge, and a great milestone to the genre. Complex without being overly so – there’s never too much to handle or micromanage. Some freedom to design the city as you choose, as long as you meet the rules. Smart graphics for the period and resources. Excellent use of maps and overlays. Sometimes growth just doesn’t happen, with no clear reason why. Light and accessible, but too primitive for a serious crowd. None of the enhancements from Nintendo’s SNES version. What really always bothered me about games of this kind is that there is always this magical tipping point after reaching which you will never have to really care about anything anymore. Your income is just so high that you can do anything. On the one hand, you can do amazing things when you don’t need to worry about finances anymore, but on the other hand, it gets old really fast.